When we last left our hero with the hairy feet, Bilbo had escaped from the goblins’ cave with the golden ring, but we also had to leave behind at least one puzzle: liberating Thrain’s key from the dungeon. I hope that the solution to the puzzle lies ahead, or at least that I’ll come up with some brilliant plan--but it could also be that the legendary randomness in the engine has doomed me to failure. Am I in a walking dead situation? How would I know? All we can do is press onward! As we marched east, we passed Beorn’s house (empty except for a packed lunch) and then ended the post at the entrance to Mirkwood. In the book, this is where Bilbo was nearly killed by spiders and elves, so this should be pretty exciting! At the Forest Gate, we are presented with a fork in the road: we can go east along the Elf-path or south to the Old Forest Road. I honestly don’t remember what path Bilbo took in the book, but the road seems like a good place to start. It doesn’t take long to regret that decision as “pale and bulbous” eyes start to follow us. Two screens later, Bilbo is ambushed in front of a waterfall and we die. Time to restore and try the other direction! The Elf-path doesn’t have the strange eyes, but we don’t make it very far in this direction either before it ends at an enchanted river. (According to the map, it’s actually called the “Enchanted River”; Tolkien was very good at place names, but he may not have been trying as hard for The Hobbit.) Since there is no obvious way forward, I get creative and try to swim. As soon as Bilbo hits the water, he falls asleep and drowns. I restore and wonder, “what does this river do to dwarves?” Let’s just say that Thorin drowns as well. Since the manual says we need Thorin alive, I restore to avoid a Dead Hobbit Walking scenario. In the excitement, I forgot to take a picture immediately. While I was out, a random elf had wandered out of the forest, captured me, and threw me into the Elvenking’s strangely familiar dungeon. When the screen redraws, there is a “press any key to continue” moment so once I was caught the game paused until I got back. I assume that if the game hadn’t paused for the graphic, I’d have died from a warg or other wandering beast. Is getting captured a good thing? I have no idea, but will assume so for now. If I discover that there is something I missed in the forest, I can always go back. Bilbo passed through here in the book so I’m probably not too far off the mark. The strange thing about this dungeon is how easy it is to escape from it: every now and then someone unlocks the door. Seems suspicious, doesn’t it? 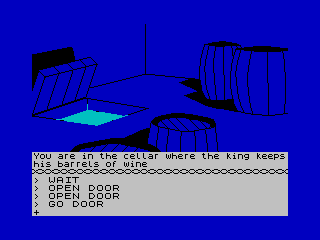 Outside the cell is two rooms: one that looks to be the main hall of the Elvenking and the other is his wine cellar. The main hall has a “magic door” that I cannot open, so let’s concentrate on the wine cellar first. When I think of elves in Middle Earth, I think “drunkards.. Inside the wine cellar is the “butler”, an odd elf that seems to spend his time drinking wine and then throwing the empty barrels down a trapdoor. In the book, I recall that Bilbo filled some of the barrels with dwarves and rode one to safety, but this time around I only have Thorin and--I just realized--he didn’t get captured with me. Do I need him? If I keep pressing forward and he is stuck somewhere or dead, do I lose? I guess I’ll keep going and see what happens. The trapdoor leads to water, but hobbits can swim, right? I try swimming but the rushing water immediately smashes Bilbo to a pulp against a metal portcullis. I restore and look for a lever or a button to open it, but no dice. I suspect that I can climb into a barrel as the dwarves did in the book, but if so I can’t find the right words. And then I remembered that my lunch was getting cold. Go home, Bilbo. You’re drunk. When I came back to the game a few days later, I was refreshed and energized. I also came back having realized that there is a vocabulary list in the back of the manual that I could have been consulting the whole time. I’ve played a lot of these games by now, but I still can’t really claim to be “good” at them! I restored back to the goblins’ dungeon and very quickly worked out what command I needed Thorin to execute: “carry me”. I had been focused on “lift” and “push”, trying to just get a little boost. But this works, too! He picks me up, I am momentarily disappointed that I do not have a graphic for being carried by Thorin, and then I ask him to go through the window. Just like that, we are out of the dungeon and I have Thrain’s key. It’s all very obvious in retrospect, but difficult in the moment. That still left me with the problem that I didn’t really “solve” the forest puzzle and I had no idea how to get back to the Elvenking’s palace. I hiked back to the entrance to Mirkwood expecting to work on this next, but--miracle of miracles--the wood elf is waiting there and captures me. I’m pretty sure somehow that’s not supposed to be that easy! Back in the wine cellar, I solve that puzzle by using the ring to wait until there is an empty barrel (and a drunk elf), typing “climb into barrel” with the difficult part being that I wasn’t using “into” earlier, and then closing the lid. The butler tosses the suspiciously heavy barrel down the trapdoor and we’ve escaped! Dale never fully recovered from the Great Acorn Famine. The barrel comes to rest on the shore of a long lake and we are presented with two ways to go: north or east. I know from the map that north is the dragon, so that is the way that I go first. We pass through the ruined town of Dale before arriving at the Lonely Mountain. 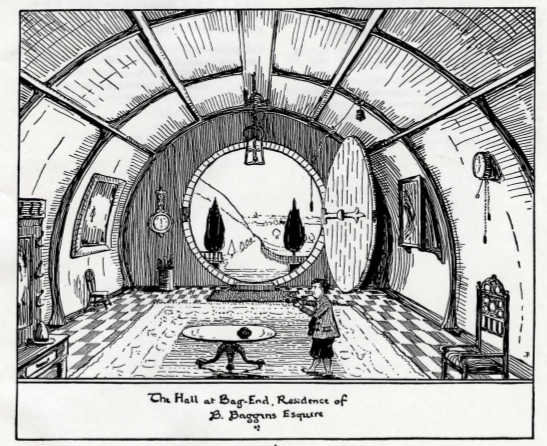 In the novel, Bilbo had to take a secret entrance into the dragon’s lair, but I’m throwing caution to the wind and rushing in. To my surprise (and relief) Smaug doesn't seem to be home and he left his treasure unguarded. That seems too good to be true, but I pick it up anyway and get out of there. I don’t stay lucky for very long because once outside, Smaug shows up and isn’t entirely happy about the situation. I try to escape using the ring, but he is not so easily fooled, telling Bilbo that “I may not be able to see you… prepare to die!” Dragon fire can cover a large area, affecting visible as well as invisible hobbits. Bilbo is dead and time to reload again. Because a wooden town makes perfect sense near a fire-breathing dragon. On the next restore, I head east to find myself in Laketown, the village where all the people that used to live in Dale now live. We’re told that the town is made of wood, but somehow that doesn’t seem like the best building material for a dragon-infested area. I also find a new friend: Bard. Even as a kid, I didn’t understand this. Why would you name a guy “Bard” if he wasn’t a bard? I know they call him “Bard the Bowman” all the time, but it still sounds funny to me. I not saying that Tolkien needed to call him “Steve the Bowman,” but perhaps he could have found a name that didn’t imply a different occupation? Of course in real life, kids are named by their parents and every woman named “Joy” doesn’t have to be the happy sort. But in fiction, this type of misnaming seems rarer. 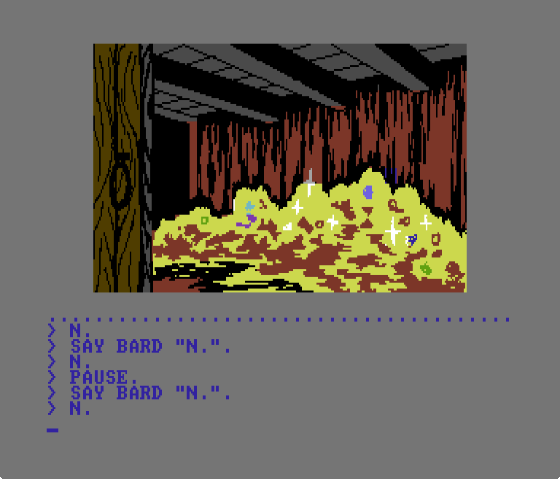 Since I know from the books that Bard strikes the killing blow against Smaug, I coax him to head toward the dragon using the “say to” command and giving him directions. One room at a time, we make our way north, but this time we don’t even make it to the dragon’s den; we find Smaug is on patrol outside. 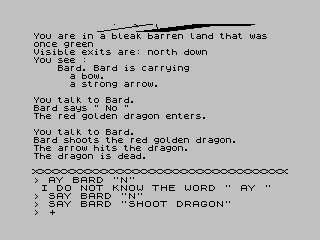 As soon as we see him, I instruct Bard to “shoot the dragon” and he let’s loose a single arrow. It works! The dragon is dead! The “red golden” dragon. Which is it? I honestly expected there to be more to the endgame than this. What about the back door? Thrain’s key? Where the heck are Thorin and Gandalf? What about the Battle of Five Armies? The eagles? Apparently, none of that matters. The dragon is dead. We waltz north to his cave and pick up his treasure. Time to go home! Seems a bit anticlimactic now, doesn’t it? I start working my way back west, not really having a clear idea how to get back. After all, I did end up skipping the forest and who knows what else when I was captured by the wood elf. A few screens later, I find Gandalf by the river--I guess he managed to make his way past the elves after all! Continuing west, I’m back in the forest and get killed by a spider. I try again and somehow manage to make it through. Not much else gets in my way: we pass Beorn’s house, the Misty Mountains, Rivendell, and the trolls with nothing new to see. Back at Bilbo’s house, I put the treasure in the chest and the game is over. There isn’t even an ending graphic. In the original book, Bilbo returns home to find himself declared dead and all his neighbors going through his things. This time around, he gets a parade! Not a bad upgrade! But as the game ends, I have only one thing to say: Has anyone seen Thorin? Now this is a dragon to be afraid of. The version of The Hobbit that I played was the original version, but probably not the one most players are familiar with. 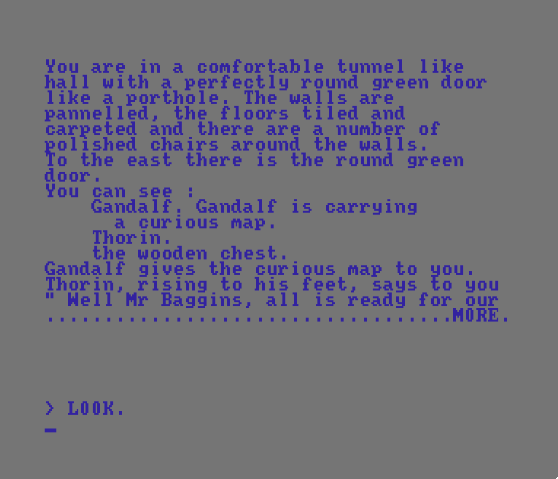 In the years after its release, The Hobbit received significant upgrades: new text, new graphics, improved puzzles, and even background music. I had originally thought this happened all at once, that Beam commissioned a “2.0” version to celebrate the unanticipated success of the original or launch it in international markets. There may still be some truth in that, but further digging reveals that Beam gradually updated the software over several years. The first changes appear to have added only a year after release, in 1983. The MSX port released that year includes upgrades visuals, but only on some of the screens. At the other end of the timeline, I know that background music first appeared in a 1987 edition for the Commodore 64. Between those points, it becomes fuzzy: when did updated graphics appear for all screens? when did the updated text first appear? when were the puzzles updated? I am not sure. 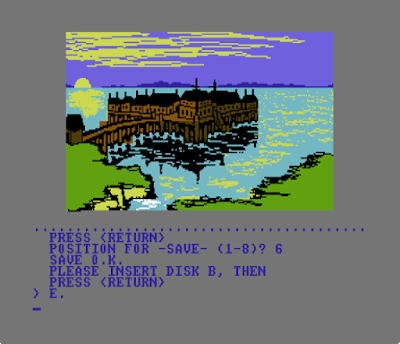 The alternate version that I am most familiar with, and the one that I will be primarily discussing, is a two-floppy release for the Commodore 64 that came out in 1987. This one appears to be the “ultimate” edition of the game, one that has all of the best features from the other platforms. If there are other better versions, I’d love to know about them! Laketown is beautiful this time of year. As a graphics update was both the first improved feature as well as the most obvious one, let’s start there. 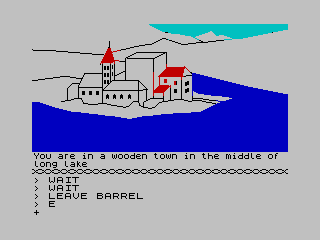 While the original game sported a fair number of low-quality illustrations for some of the game’s locations, later editions featured higher-quality images and images for more locations. Some of these updates seem to be based on the original 1982 artwork, but others (such as the view of Laketown, above) are fully redesigned. A 1987 edition of the manual credits Russel Comte and Greg Holland as the new artists, but how much of the work was them and how much was the original artist, Kent Rees, is unclear. At least some of the new designs bear a remarkable likeness to sketches made by J. R. R. Tolkien himself, such as the opening scene at Bag End. Using the classic designs at least shows that they did their homework and they worked well with the tone of the story. The two new artists have credits on numerous games into the early 2000s, but none that we are likely to play. An original sketch by J. R. R. Tolkien. The next thing I noticed about the game was the improved text. While I have been unable to find a new author credit for the update, it is obvious that someone with talent was brought in to rewrite much of the prose of the game. Many of the room descriptions are better, there are improved event texts, and overall the words feel more polished. The minimalist language of the original may have been necessary because of memory limitations, but with those removed the words flow considerably better. It’s not perfect (there are still spelling errors), but it makes the game a more pleasant experience. Remake opening text. Do you see the spelling error? One of the big surprises for me as I played the new edition was the background music. 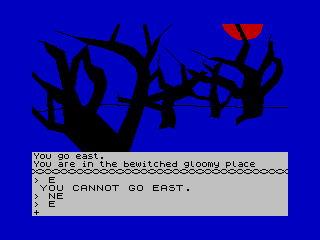 Very few of the text adventures that I have played so far have had any music to speak of, but this game goes farther: different areas have different music. Much to my surprise, someone on YouTube has ripped all of the tracks for streaming, if you want to check them out. All of the new music was composed by Neil Brennan who joined Melbourne House in 1986. He worked on the music for a number of video games over the years, although these days he is the CTO of a company offering “crowd-sourced business loans”. Not a big fan of spiders. It’s harder to avoid this area in the remake. With all of the other changes, it is perhaps unsurprising that some of the gameplay was updated as well. The first change that I found was that you are pushed very hard into taking the northern road (the “Elf-path”) to the Elvenking’s castle. After the “gloomy place,” there was a river just to the east that I could not find a way to cross. The hint book says that you can look across the river to see a boat. Using the rope, you can snag the boat to pull it to your side. That would let you cross into a maze-like area filled with spiders, spider webs, and rooms that kill you slowly by sucking you into the bog. I died a great deal trying to play through that part. You can still choose the Forest Road in this edition, but it is more difficult than I experienced. The falling spiders are deadlier now and I needed to consult with the hint book to find a pattern to get past them. (You have to wait twice in each room before moving. I’m not clear how anyone would discover this.) Once past, you can still get captured by the wood elf and taken to the Elvenking’s castle where the two paths join again. Enough gold to swim in? Once in Laketown, the end-game is also more challenging. In the original, Smaug would occasionally patrol around outside his lair and be vulnerable to attack. Now, the dragon will only leave his mound of treasure after you steal some from him. To make this even more difficult, the dragon guards the front-door in such a way that you can be roasted on arrival. You need to use the backdoor (unlocked with Thrain’s key) to get by him. There’s also a new maze on the mountain and a time limit for how long the door will show up--and never come back. These changes combine to make the game much more difficult and I was unable to get past this point, having arrived just a bit too late to use the door. It is still possible for me to win if I eat a number of lunches to boost Bilbo’s (invisible) stats, find cannon fodder for the dragon to kill as a distraction, and then get lucky enough that an insignificant hobbit can defeat the mighty dragon with his sword. Even if it’s possible to win, I think I’m done with the game for now. It’s fun, but time to move on. 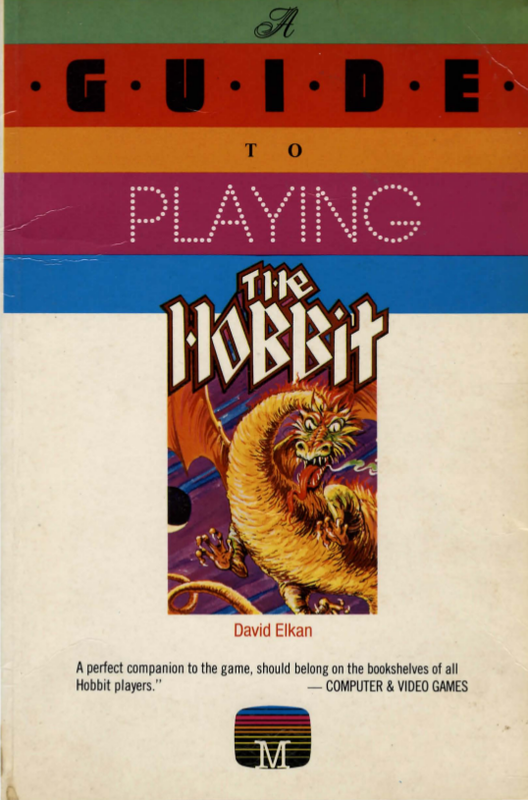 A book for people still playing The Hobbit two years later. I know that not everyone shares my fascination for strategy guides, but I love them. I have boxes full of old strategy guides in my basement; I went a long time where I wouldn’t even buy a new game if I didn’t get the guide for it. In my defense, I rarely read them before I had beaten the games, but there were certainly times when I gave in to the temptation. 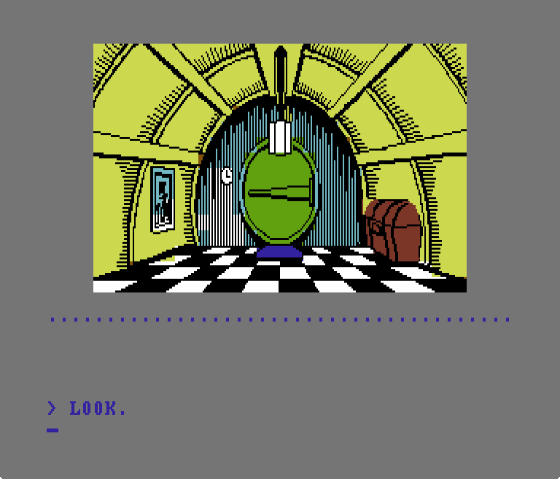 My favorite guides are the ones, like we saw with Space Quest IV and Willy Beamish, that provide behind-the-scenes details or production artwork. 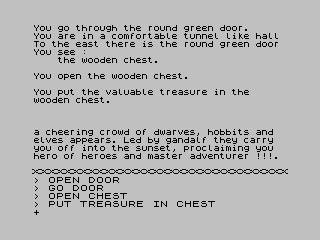 They can’t all be classics, but a good guide enriches the gameplay experience. 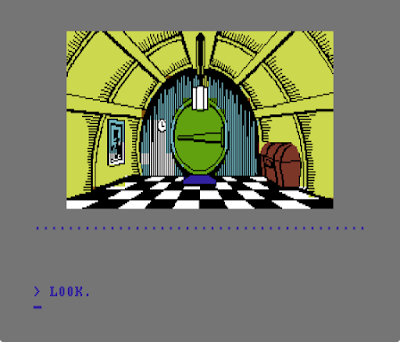 The first section, entitled “Through The Round Green Door,” provides general tips and tricks, information about how the engine sees things (for example, the way it thinks of health and weight), and other advice for beginners. A final section, “A Tourist’s Guide to Wilderland,” is a location-by-location reference with what happens and the exits from each room, listed in alphabetical order. Bad advice in table format. As I was putting together this post, I wrote a treatise on how terrible this method was, what better methods exist today, and even a brief history of computer spreadsheets. To save us all a lot of time let me say that 1) this is the earliest example of solving an adventure game using a matrix that I am aware of, 2) I use matrixes like these for mapping mazes, as you saw in the previous post, and 3) the specific method they are employing takes a good idea and does it very badly. I’ll leave it an an exercise for the reader to see why their method wouldn’t work well, especially if working by hand on graph paper. This guide book was only sold in the UK as far as I can discern. The 1987 manual that I have been working from for the remake includes an abridged hint section at the back, so it could be that the US publishers did not yet see the advantage to making you pay extra when you get stuck. 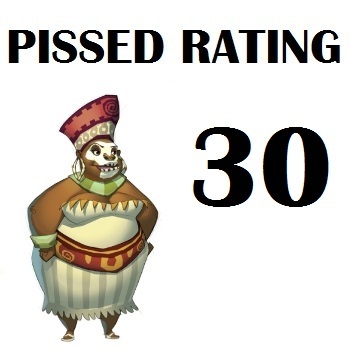 I’ve procrastinated enough; it’s time to figure out what our rating will be. Just a reminder, I will be rating the 1982 original version of the game, as well as the “final” 1987 remake. You can get points for either score, but the 1982 one is what will be recorded in the spreadsheet. One of the most unique aspects to this game is the way in which it utilizes NPCs to create unexpected behaviors. 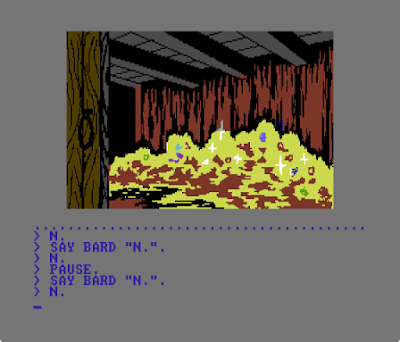 While it is too much to call them mini-AIs, each of the characters in the game are programmed to respond to stimuli in different ways. Occasionally, you might get into a dead-end situation where an enemy offscreen manages to kill a critical character, but this did not happen to me. Even then, it’s clear from reading the several guides on the game that the authors considered some of these issues and provided alternate solutions. Did Bard the Bowman die? Well, it’s still possible to win because even Bilbo can kill the dragon if you boost his stats enough and get lucky. That leads in nicely to my second major admiration for this game: multiple solutions. Finding the goblin maze too difficult? It’s possible to beat the game even without getting the ring. Can’t solve the sleeping river puzzle? You have an alternate path. 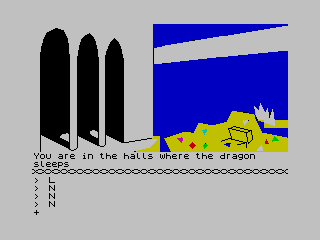 There are also two ways to enter the dragon’s lair and more than one way to beat the dragon. The stone trolls: my least favorite puzzle in the game. I found the difficulty of the original to be close to perfect: I had to think hard about what I was doing and even got stuck at several points, but I was able to persevere. The second half may have been a bit too easy as so much could be skipped, but that was addressed in the later editions. None of the puzzle solutions were off the wall, although a few had specific vocabulary requirements that took trial and error. There were some missteps, especially the puzzle with the trolls in the beginning (a time mechanic used one and then never again), but by and large I liked them all. I’m going to dock the remake a bit for strengthening the later puzzles a bit too much, moving the needle farther away in the “solvability” department. 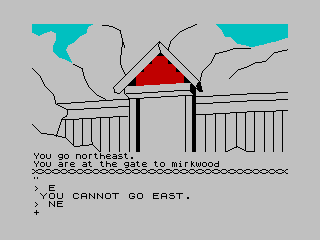 As the original came out in 1982, it’s no surprise that the interface isn’t very polished. Even so, what we have is bad even for that era. The backspace key, for example, deletes the entire line rather than the last character. Make a typo? Start the line over again. 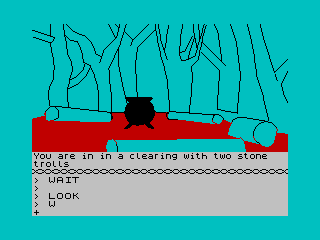 I confirmed that this was not a ZX Spectrum issue because other games have the backspace key do what you expect it to. The original also supported only one save, but this may have been a limitation of the hardware more than a design decision. 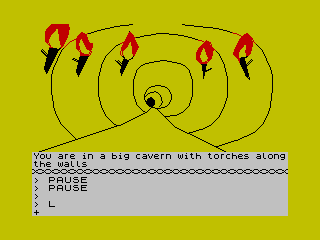 You can pick up a torch here, but since you needed a light source to get this far, I don’t see why. The inventory side is similarly unpolished. While you can give the game credit for giving many items multiple uses (you can kill things with the rope, for example), none of them have descriptions. 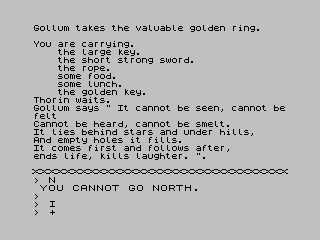 Some of the items, such as the gold key you find outside the Misty Mountains, only add to your score at the end rather than contribute to solve a puzzle. The remake adds a working backspace key and multiple save slots, so I suppose that is something. I have to go low on this score, I really do. 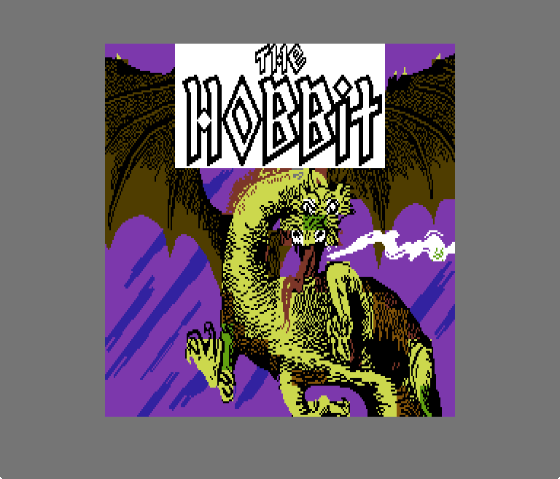 Original cover to the Hobbit novel. This category is much harder than you might think. The original version of the game shipped with a copy of The Hobbit, one of the best fantasy novels of all time. How could we go any lower than a 10? But since the novel wasn’t written expressly for the game (unlike the Questprobe tie-ins), I do not think we can consider it. We have to judge the game’s story on its own merits. But truth be told, you need the novel because the story doesn’t all fit together from the limited text we have in the game. You never learn, for example, who Gandalf is or are shown his powers in any way. We enjoy it when Elrond gets captured by goblins because we know his character from the books, not because he shows any characterization in the game. The setting is still fun, and the hints of a deeper world are tantalizing, but it’s not quite the same without the book. 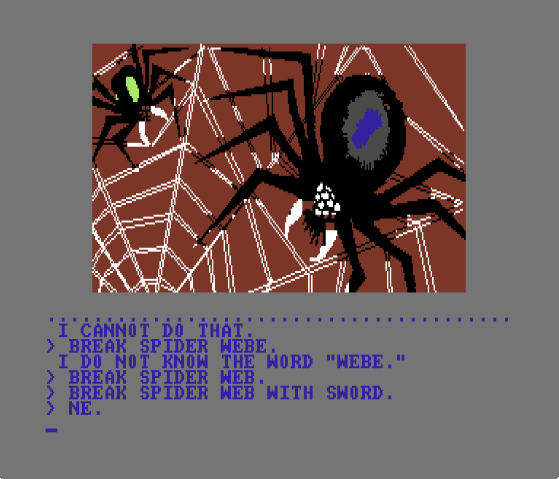 The remake attacks this problem by providing more flavor text as well as many more illustrations. It’s still not perfect, but someone unfamiliar with the books would have a better time with the remake. One of my favorite images for some reason. 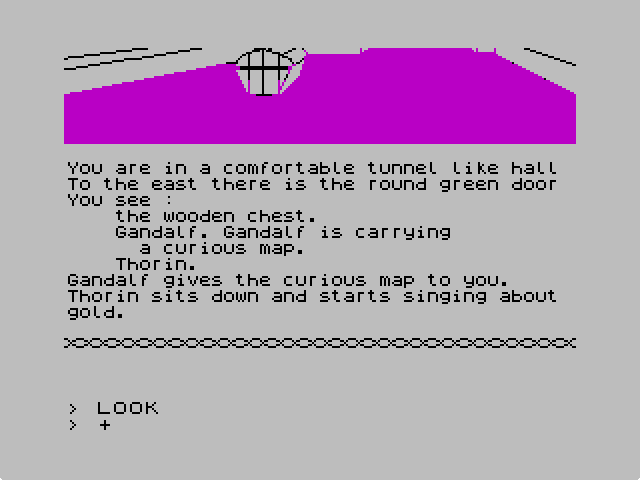 In an era where text adventures were still king, the graphics of The Hobbit must have stood out as among the best. Unfortunately, we have to judge them without that historical context and what we have isn’t actually that good. We only have images for a fraction of the screens of the game and while some of them are great, others are embarrassing. The combination of limited and low-quality graphics makes scoring this game higher than a “1” pretty much impossible, no matter how ahead of its time it was three decades ago. Given that improved graphics were some of the first adjustments to the game post-launch, it’s not surprising that by 1987 they were looking relatively nice. The latter version has well-designed illustrations for every screen and surprisingly decent background music. Every time I come to this category, I struggle. I interpret this always to be less about how much I liked the individual rooms and more about the way the game makes you feel overall. If anything, it’s even harder to build a wall to judge this category wholly separate from the original book. And yet, I can’t help but to come back to thinking that the game was a lot of fun. There’s a real sense of tension, especially with the random aspects, and I loved that you really could not know what was happening even a screen away. 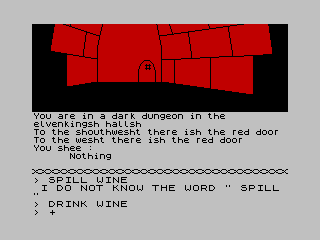 There are also nice touches that I keep coming back to--all the text changing to “drunk mode” after Bilbo drinks the wine from the barrel, for example. I find the game to be better than the sum of its parts. The remake improves on this slightly because of the improved visuals and mood-setting music. 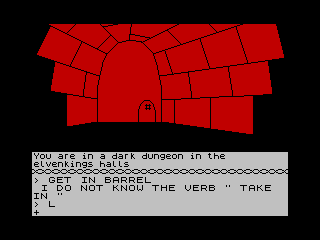 When looking at text adventures, “Dialog and Acting” usually means the prose descriptions of the world and our interactions with it. Once again, I can’t score the game all too highly in this category. The descriptions are terse with only a handful of events to depict. 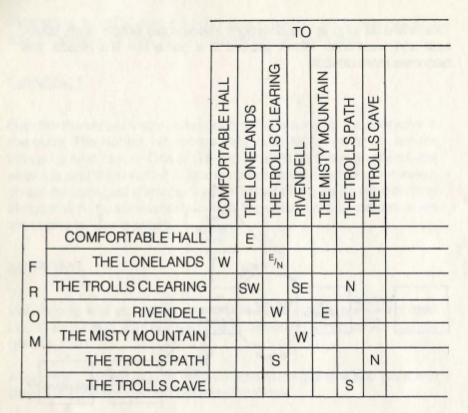 Some of the best text, such as at the trolls’ clearing or with Gollum’s riddles, is cribbed from the original books. And yet, I need to give some additional score here because the “acting” is so unexpected for a game of this age. The NPCs are frequently interesting, or at least they do unexpected things. Thorin is the best-written of these, with his impatience coming through whenever you are in the room with him, even as he really just wants to sit around and sing about gold. Gandalf wanders around picking things up, looking quizzically, and then putting them back down again. Elrond keeps feeding you for no reason, like an elvish grandmother. These little details add up and I don’t have a better place to give credit where it is due. The remake gets one more point by vastly improving on much of the text. Time to tally up the scores. The original game received (6+1+3+1+4+3)/.6 = 30. That is one point better than Mystery House and that feels about right. I enjoyed this game a great deal and it has a replayability that most adventure games don’t have. It’s still very old and very unpolished, but it makes up for it in sheer chutzpah. The 1987 edition received somewhat better scores overall, (5+2+4+4+5+4)/.6 = 40. That feels ever so slightly high to me, but I don’t see any scores I can disagree with. Our winners this time are Lartes and TBD! Congratulations! Lartes correctly guessed the original game’s score of 30, while TBD came oh-so-close with the remake’s score. Overall, the guesses were pretty close, averaging 32.5 for the original and just about 37 for the remake. Just a reminder: CAPs will be awarded with the next main game "Final Rating" post. Luckily for you, I think that's this week! Well done Joe. I think that these ratings are eminently fair. What a strange little game! I guess this shows that improving a game depends just on few things - better graphics, some added music and better text and you've got yourself a better game with ten more points. The end of the year is turning out be quite detective themed. Well, I won't complain. But that makes sense, doesn't it? The trick is that the 1987 game was still tremendously dated by the time all of those improvements came together. It's a great improvement to buy some more shelf-life on a 5-year old game, but that's really all it is. Red gold is sorta like black gold. It's just less well known because it's Russian, and possibly bootlegged. Black gold? You mean Texas Tea? Russian Tea dragon just doesn't have the same ring to it, is all, TBD. Regarding some spam I just deleted - I just love how our spammers try to hide themselves like they would have actually read the post. We set up a poll asking whether our blog needs a new designer - and a designer spam appears. Then we do a Missed Classic, and our next spammer starts with "Is this a classic? ", before advertising some completely unrelated thing. Still can't beat the Nigerian witch doctor who keeps targeting Aperama's Spellcasting -posts - he's apparently "a real sorcerer". I quite liked the one that asked if Les Manley 2 was the precursor to GTA: San Andreas, myself! Yeah, that one was classic alright! Now just to get what the link would be... I guess you could say both games are prone to corrupt children. 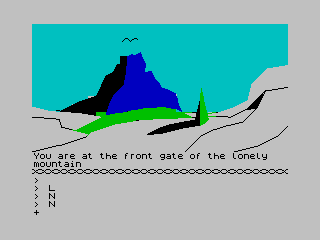 Or at least Les Manley 2 is - or anyone playing it, no matter what the age. L.A. and San Andreas are kind of the same place, that's a good enough connection for spam! Regarding the Trolls, I remember you could kill the by saying "LUX". But I may be confusing it with The Boggit. Also, I think it should be "Inglish", not "Ingrish". Poll results: Should we change our colours? Les Manley in: Lost in L.A. - Final Rating! Les Manley in: Lost in L.A. - WON! Les Manley in: Lost in L.A. - Did I say WON! ?